It’s that time of year again—Brenda Novak’s Annual Online Auction for DiabetesResearch will begin on Tuesday May 1st and run through May 31st. There are tons of fabulous items up for auction and the Super Authors have their own page! Geri Krotow is offering the coolest prize—a Skype book club session, with books! 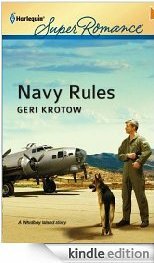 The package includes the Skype session with Geri, 10 signed copies of her June 2012 SuperRomance Navy Rules and 10 small Navy related gift bags! Sarah Mayberry is offering all eight of her SuperRomance novels—A Natural Father, Home for the Holidays, Her Best Friend, The Best Laid Plans, The Last Goodbye, One Good Reason, All They Need, More Than One Night—and an assortment of Australian goodies for an authentic immersive reading experience! Including: Tim Tams, Vegemite, Cherry Ripe bars and other delicacies. 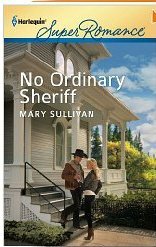 Mary Sullivan is offering an autographed set of all six of her books set in Ordinary, Montana—No Ordinary Cowboy, A Cowboy’s Plan, The Cowboy’s Son, Beyond Ordinary, The Ties That Bind and No Ordinary Sheriff and a critique of a 3-chapter proposal package. 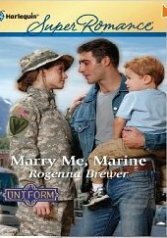 Carrie Weaver is offeirng a wonderful Arizona gift bag that includes autographed copies of Once a Ranger and Welcome Home, Daddy, both set in Arizona. The Best of the Best from Arizona Cookbook, a colorful t-shirt (size large) , a gorgeous insulated travel cup, Cerreta’s Cactus Chews and Redstone’s Red Chili Chipotle Chocolate and a red bandana! 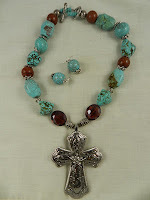 Linda Warren is offering a handmade brown and turquoise magnesite necklace with a western cross with aTexas star on it. There are chunks of irregular, round and barrel shaped turquoise beads surrounded by silver zinc findings and brown Chinese crystals. There are also matching earrings. Linda is also offering autographed sets of two popular Superromance series: The Belles of Texas, which includes Caitlyn’s Prize, Madison’s Children and Skylar’s Outlaw; and The Hardin Boys which includes The Texan’s Secret and The Texan’s Bride, which was recently nominated for the prestigious Rita Award. 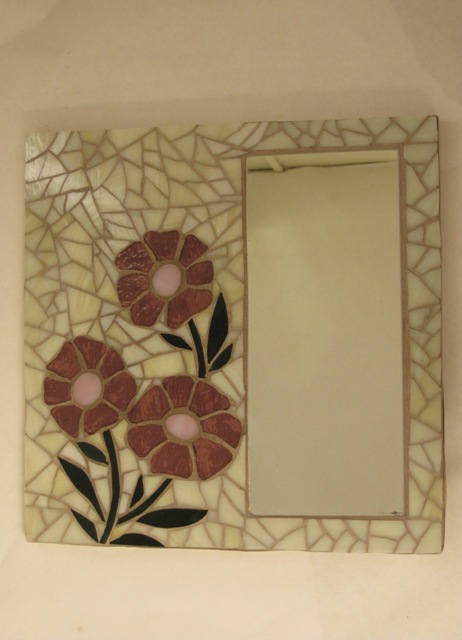 Jeannie Watt is offering a cut glass mosaic mirror. This mirror is a repeat of the most popular mirror on her auction page last year and features pink flowers on a cream background. 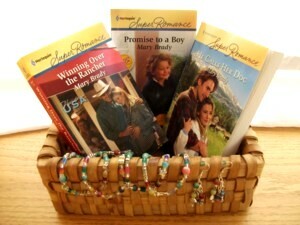 Mary Brady's gift basket includes autographed copies of her three, Montana set SuperRomance books: He Calls Her Doc, Promise to a Boy, Winning Over the Rancher. Come on out and see how Happily Ever After struggles and grows in Big Sky country. Included in the basket are TossOn™ stretch bracelets and earrings. In deference of the cause, Mary mentioned that she’s left out (eaten) the chocolate. Sure hope to see you there! Happy Bidding! I'm also offering an auction prize. My friend and critique partner, Sophie Gunn (aka Diana Holquist), and I are offering a 3-chapter critique and an e-copy of our new writing How To book. "Get Rid of the Clichés: 3 Chapter Critique" by Superromance author Ellen Hartman AND Contemporary Small-Town Romance author Sophie Gunn (aka RITA finalist Diana Holquist) using their anti-cliché busting method." Here's the listing: Hartman and Gunn Critique. All of the prizes look great. I can't wait to start bidding! Jeannie, all of the auction prizes look fabulous. I hope they raise a lot of money for the cure for diabetes. Brenda Novak does such an amazing job fund-raising with this auction!!! Tons of great stuff to bid on. Brenda is a member of my chapter so we've been looking forward to the auction for months. Wow, this auction looks like it has some really good items to bid on. WIll have to go check it out.